March 19, 2019 -- Collaborate or die. That was the message of the ECR 2019 session "Imaging Professionals within the EU: Radiologists without borders." With Brexit looming large, it allowed experts to discuss how to promote stronger relations and greater cooperation, despite the fragile political climate. 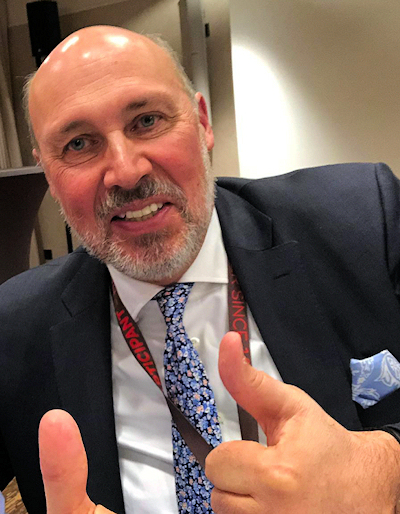 "We are living in a very difficult environment where the value of radiology is not always completely recognized by our peers," noted Prof. Paul Parizel, PhD, past president of the European Society of Radiology (ESR). Thumbs up from Prof. Paul Parizel, PhD, to the current mood of cooperation between the ESR and the UEMS. Photo courtesy of Prof. Paul Parizel. In his talk on advocacy in the European Union (EU), he outlined how the ESR and the Union Européenne de Médecins Spécialistes/European Union of Medical Specialists (UEMS, the European organization representing the National Associations of Medical Specialists in the EU), were working together to defend the interests of colleagues. In recent years, EU institutions have increasingly shaped European policies for health, research, and digitalization. This has affected clinical practice and biomedical research across the continent and had significant implications, both practice- and finance-related, for the profession and practitioners, explained Parizel, chairman of the radiology department at Antwerp University Hospital in Belgium and a full professor in the Faculty of Medicine and Health Sciences at the University of Antwerp. The ESR aims to offer a united, powerful voice to European radiologists -- and provide a single house for radiology within Europe, and, thus, the ESR strives to be involved in EU affairs, he added. Today, the ESR counts more than 100,000 members from 163 countries, making it the world's largest radiological society. The ESR closely monitors and assesses EU legislation and policy developments to ensure that EU initiatives benefit clinical practice and patient safety. It also ensures ESR representatives participate in the complex EU policymaking arena as partners in stakeholder consultations and expert groups and regularly organizes policy events and issues statements and position papers. A case in point, last year Parizel was involved with a European Commission conference called "Addressing societal challenges to advancing the medical, industrial and research applications of nuclear and radiation technologies." The purpose was to have an informative discussion to shape the European Commission's future policy agenda in this area. Radiologist involvement in the two-day meeting, namely in the quality and safety session on improving medical practice, was essential to put radiology on the map and make legislators understand that radiology brings value to the medical profession, he said. In addition, the ESR organised an event at the European Parliament in June 2018 called "From health policy to practice: Medical imaging as an example for improving patient outcomes through technology adoption," bringing together representatives from the EU institutions and health stakeholder organizations, to discuss the role of technology in translating policies into practical benefits for patients and healthcare professionals. The event presented concrete examples of how radiology, a field always at the cutting edge of technology adoption, can lead the way in demonstrating the transformative impact of research and innovation in clinical practice in the interest of patient safety, according to Parizel, adding that organizing such meetings can be challenging. "It is not easy to get inroads into those leadership events of the European Commission or the European Parliament. But we strongly believe that the ESR has a role to play in EU affairs," he said. "We try to adopt a proactive approach by establishing good working relations with EU institutions and with other stakeholders in the field of healthcare, research, education, innovation, and professional issues. 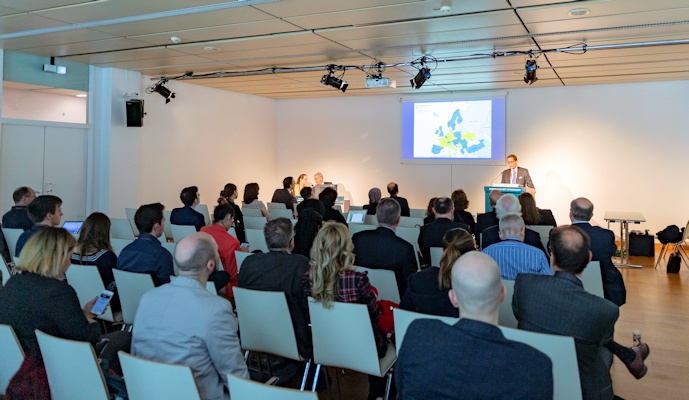 Down to business: ECR 2019 attendees confronted professional challenges during the session. Photo courtesy of ESR/Sebastian Kreuzberger. Together we can do much more than one society alone, and together we can be instrumental in shaping future EU policies, he commented. Cooperation has existed between the societies for a number of years: UEMS endorsed the European Diploma in Radiology (EDiR) and both societies also work closely together in the ESR's European Training Assessment Program, and in Accreditation Council in Imaging projects. Furthermore, UEMS observers have a seat on the European Board of Radiology's shareholders board, and on the EDiR scientific board. "It might not seem like much, but I am old enough to remember a different time. I'm very, very happy and also proud that both of our organizations have progressed down such a significant road together," Parizel said. How will radiology change in the coming years -- not just due to Brexit but also the "challenging and hostile political period"? This was the central question addressed by Dr. Vassilios Papalois, a professor of transplant surgery and lead transplant surgeon at Imperial College in London, the secretary general for UEMS, and the president-elect of the European Society for Organ Transplantation. He raised UEMS for striving to remove borders so that disciplines can work together to the benefit of both professionals and patients. "Most unfortunately, there is a tendency across Europe -- Brexit being a prime example -- to get the walls up again," he noted. At a UEMS meeting in April 2018 in Morocco, the British Medical Association's position was clear, according to Papalois: The association wishes the borders to stay down for collaboration, exchange, innovation, and aspiration to continue for the benefit of the profession and patients. The UEMS unanimously accepted that the 170-year-old British association would stay in the UEMS to represent British doctors. Describing UEMS as one of the first and the oldest medical associations to date, Papalois noted that from its birth in the ruins of World War II, 60 years ago, UEMS now represents 40 countries through national medical associations, 60 specialist bodies within and outside of Europe, and 1.6 million medical professionals. Its main aims are to advance European health policy, promote collaboration, and high standards of education, training, practice, and care, this through European training requirements, center appraisal, and its event accreditation system, European Accreditation Council for Continuing Medical Education (EACCME). Papalois said he was optimistic that any threat to unity will ultimately fail because of the realities and necessities of the environment: One such reality is the movement of patients and healthcare professionals across Europe and the interdependence of these healthcare systems. He stressed that quality patient care can't be achieved by individuals but by standards formed on common practice and collaboration, particularly in light of the phenomenon termed the "invasion of specialism," which will continue to foster exchange. As a case in point, he referred to the recent growth in the European reference network that aims to tackle cross-border problems to offer the best possible patient care. "The number of specialties and competencies is multiplying by the day, and this reflects the way we practice in the modern world. Expertise in these sophisticated, challenging areas cannot be in one country and one place," Papalois stated. "Patients demand a good medical outcome and a good quality of life outcome -- and this definition ... is beyond individual countries. These standards are universal for British, Italian, and Austrian patients." By 2060, 40% of the population will be older than the age of 60 years. Europe's vulnerable populations will place massive demands on medical services, and this will require increasing a fluid and local healthcare workforce that can provide solutions close to where these patients live. Individual country resources cannot tackle this issue, which requires collaborative design projects that don't yet exist, he noted. Touching on advocacy, Sabine Berger, a representative of the European Commission in Vienna, spoke about the value of radiologist participation in policymaking during her presentation, "Creating a European workforce: the value of qualifications across borders." She highlighted why it was important for radiologists to contribute to European legislation, particularly given the rapid development of this highly specialist sector. "We need to have practical solutions. It doesn't serve anybody if we make regulations, delegated acts, and directives which are then not helpful for doctors or for patients. And of course also we need legislation that is accepted, that is respected. We don't want to sit in our ivory tower. We are happy to get input," she said. "Whenever you have the feeling that something is wrong, even outside public consultations, experts in the Directorate-General for Internal Market, Industry, Entrepreneurship and SMEs (DG GROW), which deals with the issue of free movement, will always be happy to hear from you and get your input," she stressed.